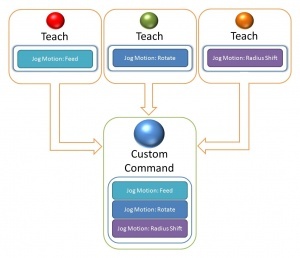 A single Custom Command can contain any number of simultaneous Jog Motions. In a SINGLE Custom Command, you could teach the bender how to combine any number of axes and actuators into one motion. 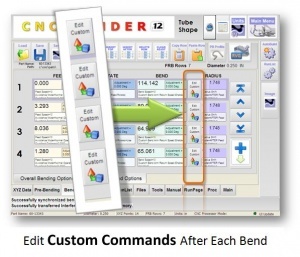 Each Bend's Custom Command changes how the bender works after that bend when transitioning to the next bend. 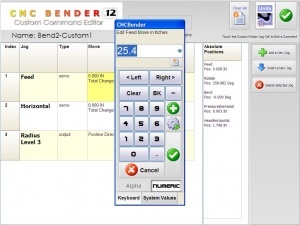 Custom Commands can be MANUALLY entered and edited without the bender running in Teach Mode. Or Custom Commands can be edited even after they were built using Teach Mode. 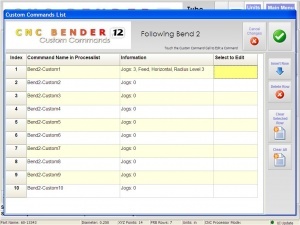 All Custom Commands are stored in the part file that contains the part data. This page was last modified on 4 November 2010, at 02:55.